The rebooted Tomb Raider is a solid if paint by the numbers origin story which also makes it one of the better video game adaptations. Of course that’s hardly high praise since video game adaptations have a fairly terrible track record. Luckily Norwegian director Roar Uthaug, who directed the impressive 2015 Norwegian disaster film The Wave, gives his film a palpable plus even if the script is fairly basic. Uthaug delivers some solid action set pieces throughout along with a shipwreck sequence which could serve as a solid test for epilepsy. Uthaug film feels strangely like a 90’s Michael Bay film if you removed all of Bay’s bombast. It’s an interesting bit of alchemy that works more often than not. Tomb Raider wouldn’t work at all if Alicia Vikander couldn’t pull off the role of Laura Croft which she did incredibly well. For the uninitiated, the video game character was rebooted in 2013 as a younger, more grounded take which serves as the basis for this film. So all the cartoonish proportions of the video game and caricature of Angelina Jolie’s 2001 portrayal are thrown by the wayside for a more realistic and grounded approach which works in the film’s favor. Vikander is fully committed to the character and she’s clearly enjoying herself as the heroine. She pulls off a steady balance of strength while still being green and learning her way. Outside of her childlike grunts, Vikander is always the best thing on the screen and gives the film its heart. The supporting cast though is sadly underused and developed. Walton Goggins is given one of the most basic villain characters to play which is a shame since Goggins is such an interesting actor. It’s a fairly large misstep mainly due to the script which doesn’t provide any depth. Daniel Wu’s character is the very definition of a one dimensional character, sure he does some things during the film but he’s more a function than a full-fledged character. Dominic West also isn’t given much to do outside of a wear a terrible wig and look slightly confused and nuts. 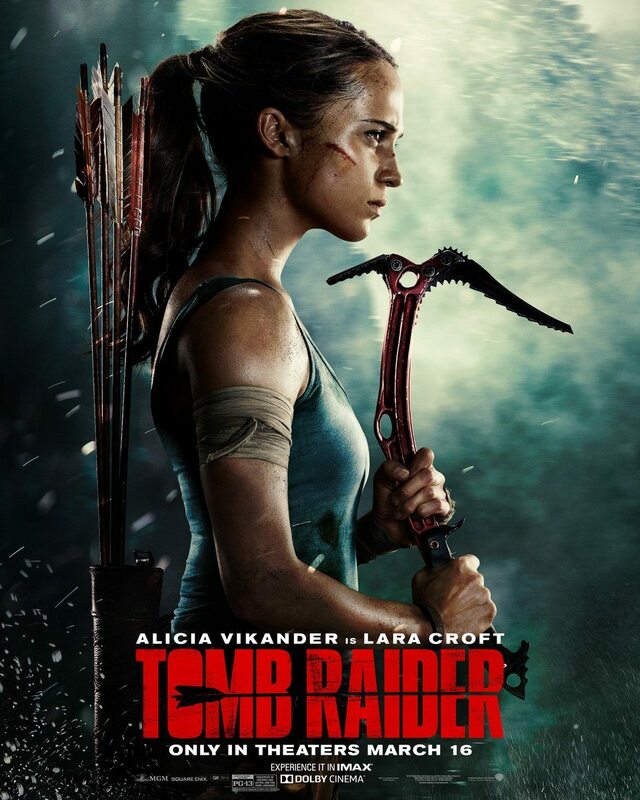 Tomb Raider is a perfectly watchable film and fans of the video game series will enjoy seeing certain sequences from the 2013 game lifted and woven into this film’s narrative but it all feels incredibly safe. The door is left wide open for a sequel should this film prove to be successful, which with Alicia Vikander in the lead isn’t a bad thing.